Over a thousand students gathered on college campus statewide Thursday to sign the agreement. 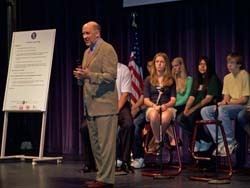 Governor Jim Doyle says the Wisconsin Covenant guarantees them enrollment at a UW campus or technical college, if they meet certain requirements after high school. Those include maintaining a 3.0 GPA, finishing high school, staying active in their communities, and taking classes to prepare them for college. The Covenant also offers financial aid incentives for students. Speaking at Madison Area Technical College, the Governor told 8th graders that the Wisconsin Covenant shows students that college is within their reach, if they stay focused. Doyle says he doesn&apos;t want anybody thinking they can&apos;t get to college. Eighth grade Students across Wisconsin are being urged to sign the agreement.